Because Claudia is a pescatarian, this one subsititutes the pork with fresh tuna. 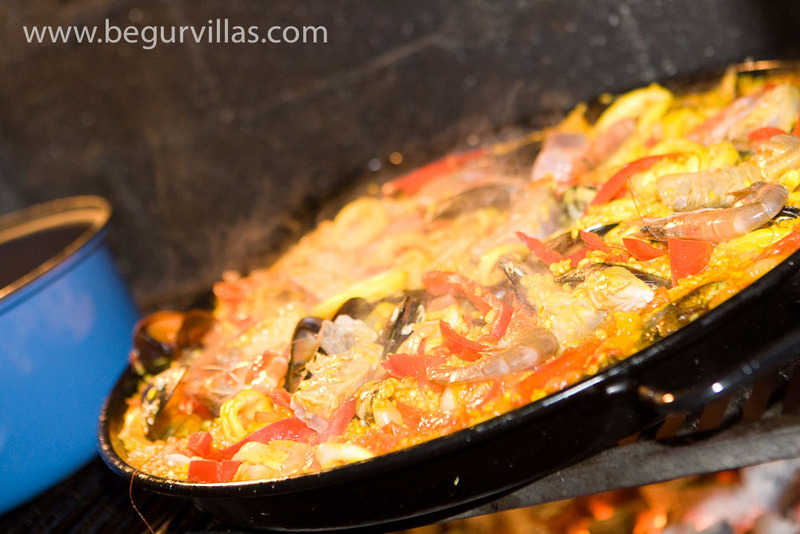 A good stock - paella is primarily a rice dish and rice doesn’t have a lot of flavour. If you use a stock cube, that’s what the paella will taste of. Don’t stir - the difference between paella and risotto is cheese and starch, to release the starch you stir risotto The texture of paella is different so, after the initial quick stir, leave it to cook slowly. That is why they use a wide shallow pan. Use good quality fish and seafood - kind of obvious but you don’t actually need a lot of seafood so buy good stuff from the fish monger, it really makes a lot of difference. The fish monger in Begur is excellent. I adapt amounts depending on how many I’m cooking for, but the left overs warm up well so I tend to err on the side caution and make too much! I am assuming a decent sized paella in a pan around 18 inches wide which will feed 8-12 people. The villas sleep 12 so we tend to cook in quantity. The first job is to peel the prawns (the small cooked ones, not the large ones). Put all the shells into a large sauce pan and the peeled prawns in a plate to use later. Add around 1 litre of water to the pan and bring to the boil, them lower the temperature and simmer for at least half an hour. add the rice and grated carrot and more oil if needed, you want to fry the uncooked rice for a couple of minutes, while stiring so it doesn’t stick. Lower the heat and spread rice so it is equally spread over the paella pan, on a barbecue I would raise the level above the fire here. No more stirring from this point! After it has cooked for about 5 minutes, start placing the tuna chunks around the pan and arranging the mussels and clams. I like to arrange the mussels, hinge down in a circle and arrange the other stuff around them. about 5 minutes later put the large prawns on in a circle, all facing the same way. The prawns and tuna will need to be turned once to make sure they are cooked both sides, so lift occasionally and flip them when needed. As the rice cooks, you can move the pan, and shake the pan (use a tea towel as paella handles get hot), but remember, no stiring! If you get a bit of burning on the bottom, lower the heat and don’t panic, the burnt bits are many people’s favourite. When the rice is nearly done, turn off the heat, sprinkle on some olives and the small cooked prawns you put aside after peeling them for the stock. Cover with a tea towel and leave to sit for 5 minutes while you reward yourself with a glass of wine. Place the paella pan in the centre of the table and when the guests are all sat down, whip off the tea towel to thunderous applause. Serve people a small amount on their plate and encourage them to help themselves to more. Wine pairing - goes well with a full bodied white wine like an anbariño or an aged white Rioja but don’t be scared to have red wine with it. The flavours are strong and a chilled red Rioja is what my Spanish father would have.